Do you own a rental property in Sacramento? Did your last tenant leave it in less-than-perfect condition? It happens! In fact, it’s an experience that most landlords face at least once. If the state of your rental property is giving you a headache, you have a few options. Here are some questions to ask yourself as you move forward with your tenant-trashed property. The first thing to do is assess the damage and decide if you should try to recoup repair costs from the former renter. Unfortunately, it may not be worth the hassle. Aside from garnishing the rental deposit, most measures for going after a tenant to pay for damages are time consuming and expensive. However, if the damage is significant enough, you may want to document the damage and take the tenant to court. From holes in the walls to missing toilets – we’ve heard of just about every type of neglect and vandalism you can imagine! 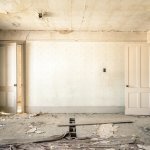 Sometimes a bit of drywall and paint will return the property to an inhabitable condition, in which case you may want to simply fix it up and rent it out again. However, if the damage is too significant to repair as a weekend warrior, it’s time to explore more drastic measures. Should you rent your house to a handyman? One little-known option is to find a handyman who wants to rent the house. In exchange for a discount on rent (or even free rent) they can turn the current disaster into a nice rental property once again. If you choose this option, make sure you have a timeline all spelled out. As long as there are deadlines in writing, both parties can end up happy with the arrangement. Are you ready to sell the house? Your final option is to sell your Sacramento rental property and leave the frustration in your rear view. However, be aware that if you try to sell the house on the open market, you may have to fix it up first in order for an agent to list it. It may be easier to sell privately to a house-buying team like ours. (We buy houses in as-is condition and we’ll fix them up ourselves). To get a fair cash offer for your property, no matter what condition it’s in, just get in touch with us and we’ll give you a no-obligation offer. We can even buy your property from you fast. Click here now and fill out the form or call our office at 916-496-3737 and we’ll get back to you right away.